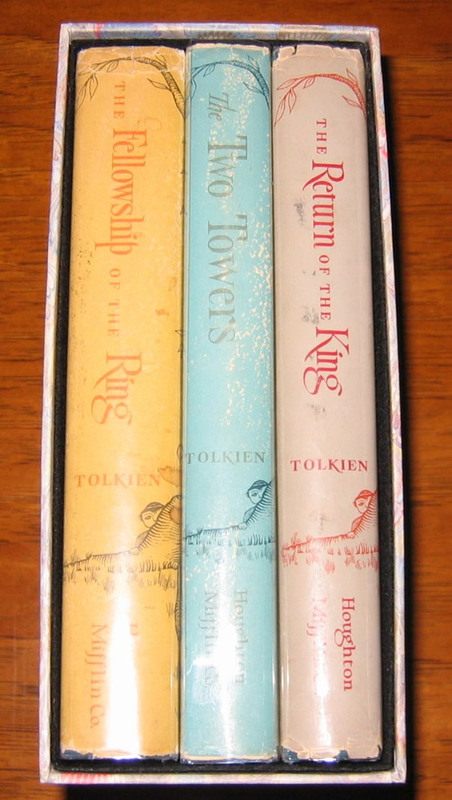 1st US Edition of the Lord of the Rings - 4th/2nd/1st with dustjackets, an early bright set - $2250.00 A beautiful early impression set of the classic Lord of the Rings. Housed in custom slipcase, the colors of the dustjackets are bright and look spectacular. A beautiful early impression set of the classic Lord of the Rings. Housed in custom slipcase, the colors of the dustjackets are bright and look spectacular. 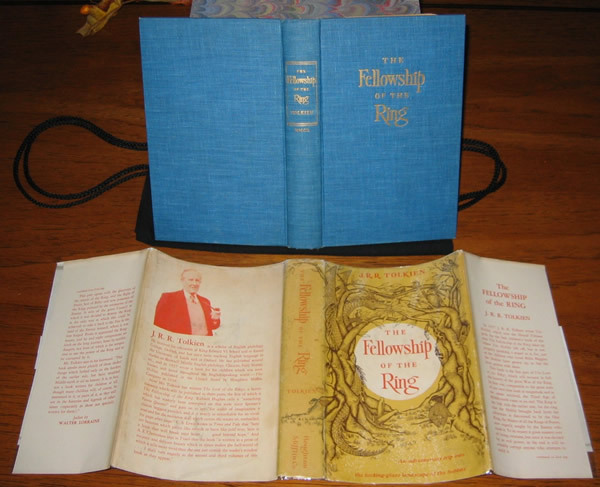 The Fellowship of the Ring is the equivalent to the 4th UK impression, whereas it is only the 3rd US impression (no 2nd impression was issued), published in 1956. This copy is in its original dustjacket, with the correct issue points. The dustjacket shows only the most minor chips to the rear fold corners of the spine. A little wrinkling on the top edge. The boards are very nice and clean, no shelf wear to the bottom. Not frayed or worn thru, also shows no bumped corners. No previous owners names or writing. The endpapers show no offsetting. The text block shows no markings or folded corners, clean & bright. The original map is present, unmarked, no tears or extra folds noted. Overall, a beautiful Very Good Plus to Near Fine example of a very desirable book. 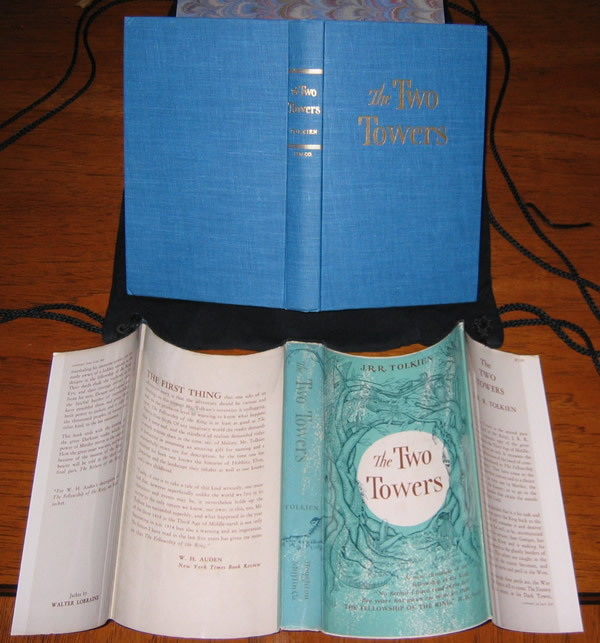 The Two Towers is a 2nd impression, in its original dustjacket, with the correct issue points of the "stripe" at the top and bottom of the front, the "gap" in the Hobbits hat, and the "cufflink", all points present and visible. These points are found only on the 2nd and 3rd impression dustjackets. The dustjacket has some minor chips and loss at the top and bottom of the spine. The colors remain bright and vibrant, with only the most minor soiling. No fading to the spine, as is so often found. The book itself is virtually fine, with no names or writing, no offsetting or foxing, and no soiling to the boards. The gilt remains bright and untarnished. The original map is present, unmarked, no tears or extra folds noted. A beautiful copy. 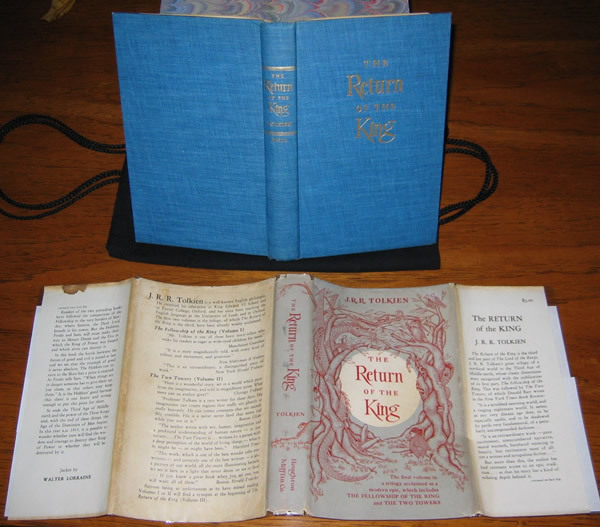 The Return of the King is a 1st impression, with the date, 1956 on the title page, indicating a true 1st Impression. The book also has the signature mark '4' on page 49, with the slipped type. The dustjacket shows no fading and only minor chips or loss, with some soiling and light marks to the spine. Shows one small water mark to the upper rear flap, doesn't mark the book or endpapers. The colors remain clear and bright, without fading. The dustjacket also shows the first state point of the "larger, bolder" dollar sign, with the double uprights extended. The book shows no soiling, with the boards clean and bright, the gilt remains bright and untarnished. The corners are not bumped. Some age darkening to the endpapers, but no names or writing. The map is present and shows no tears or extra folds, clean and bright. The text block is clean, with no markings or folded corners. Another very nice copy of an extremely collectable book. Overall the set presents beautifully, with full vibrant colors, only the most minor loss at a few corners, and no names or writing in any of the books. All maps are present, and in Near Fine condition. A scarce set, in fabulous condition.